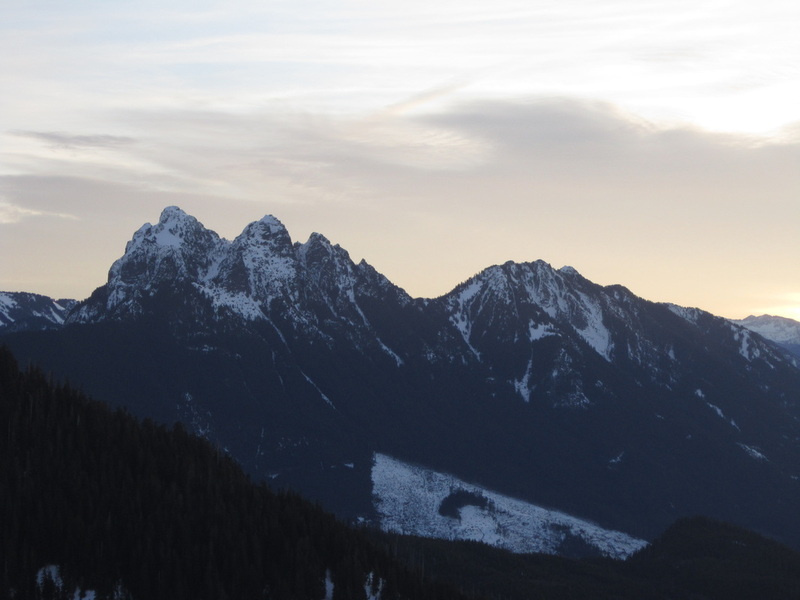 So we had a very nice period of weather in the middle of January and Ryan, Jacob and I decided to make an attempt on Mount Index via the Hourglass Route but this required us to start at about midnight so we would be on our way down the gully before too much sun hit it. The conditions were quite strange since it had been sunny for a couple weeks in the mountains causing wet slab avalanche dangers to rise however in the Puget lowlands it was very foggy for over 10 consecutive days. Therefore the mountains were warmer than the lowlands. To start the trip we drove to the trailhead and hiked up the snow covered but packed Lake Serene Trail. It was pitch dark outside since there was no moon. I remember thinking to myself "when will this trail end!" About three-quarters the way to the lake the laces in my mountaineering boots broke and I had to tie them together and rig them to keep my boots tight. Once that was fixed we continued to the lake where we studied the thickness of the ice. It was quite thick and after a quick snack break we were on our way across the frozen lake which was also covered in a couple feet of snow. To the left of us we heard ice and rock fall thundering down the steep cliffs of the Middle and North peaks on the Index Massif. Once across the lake it was a little after 2am and we began ascending the talus and snow covered slopes opposite the lake. Before too long we reached a small saddle at which point the steep climbing began. We quickly started ascending very steep snow up and to the right. We simply kicked steps one after the next making out way up the steep slope. Conditions were quite good in this section but the exposure was real. The snow was at times 60 degrees and we even had to contend with some vertical bushwhacking by climbing some trees to make it up. One tree had only a couple branches to grab onto and climb up. One mistake and there was an 800 foot cliff just below! Above that the steepness moderated and we continued up more 50 degree snow until we reached a ridge crest. Here it became substantially easier and we walked the crest for a ways until we reached the point where we needed to traverse left across a very large, broad snow slope that was about 35 degrees. Despite the steep exposed climbing we had just done, I was not at all concerned until we began traversing this slope as the snow on this slope was slightly different. We dug a pit and analyzed the snowpack and concluded it was safe for the time being. So we continued traversing and located what we thought was the hourglass gully. Here we put the crampons on and we began kicking up some steeper snow again (~55 degrees) up a gully but we realized it was ending at a vertical headwall and we were heading up the wrong gully. After carefully rereading the route description and looking at the map we realized we didn't traverse far enough across the slope and the Hourglass Gully was the next gully over. Keep in mind we had to do all this in complete darkness so seeing where we were going wasn't really an option! Carefully, we descended back to where we donned the crampons and by this point it was beginning to get lighter. I decided to simply head back across the snow slope to the ridge and wait for Jacob and Ryan to finish the climb as I was out of shape and slowing them down. So I went back to the ridge, ate a snack and watched the beautiful sunrise from the small ridge. It was only maybe 45 minutes when I saw Jacob and Ryan on their way back as well. They made it to the base of the Hourglass Gully and started up but apparently the snow in the gully was considerably worse since it was south facing. There was a thick crust underlain by feet of hoar frost...a recipe for disater if you ask me. Because of that they also turned back and I was only waiting alone for an hour. After enjoying the beautiful sunrise more and snapping some photos, we started back down. We used a series of trees as natural anchors to rappel the steep sections we had climbed and the rest of the descent back to the lake was quite beautiful. We stopped many times to admire the north faces of the Index Massif and looking for good lines. I had never realized these peaks were so rugged and they are so close to the highway. Once back at the lake we hiked back across and relaxed awhile in the sun. A group of college guys were the only other we saw that day and they arrived at the lake as we were resting. They were just day-hiking to the lake and were quite hilarious to talk with. After a long 1 hour break we finished the hike back down the trail to the car. This trail, contrary to what I was told is much longer than a couple miles! Felt more like 4 to me and it dragged on and on. Once back at the car, BBQ in Monroe never tasted so good. The next day we all went to the Lower Index Town Wall and did some nice rock climbs up the Rogers Corner (5.9) route, the Breakfast of Champions (5.10a) crack and the classic Godzilla (5.9) route.